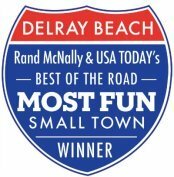 With 123 votes, Delray Beach, FL competes in Rand McNally's and USA Today's Best of the Road competition as a Best Small Towns in America finalist in the category of Most Fun Small Towns in America. More than 600 small towns across America were nominated by voting online. 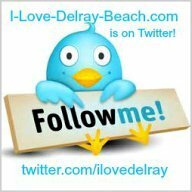 Voting took place between April 15 and May 15, 2012, and with 123 votes, Delray Beach was voted in as a finalist in the competition of the Most Fun Small Towns in America. on June 28th & 29th, 2012. Let's bring it home Delray! Keep reading to see how you can participate to help! 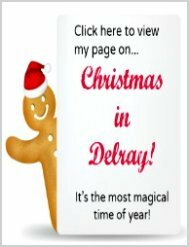 We are competing against Denton, TX, Geneva-on-the-Lake, OH, Santa Claus, IN, Buena Park, CA, Corning, NY. 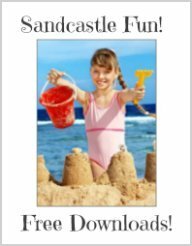 I'm thinking Santa Claus, Indiana sounds like it could be a ho-ho-ho lotta fun and might be one of our biggest competitors for the win. What do you think? For the last 10 years, Rand McNally has been celebrating small towns that are unique and filled with charm and special character capturing their small town essence. During the months of June and July, Road Rally teams will visit 30 small towns, all competing for one of the five titles: Most Beautiful, Most Patriotic, Most Friendliest, Most Fun, and Best Small Town for Food. The teams and finalists were selected after receiving the most online votes in May. 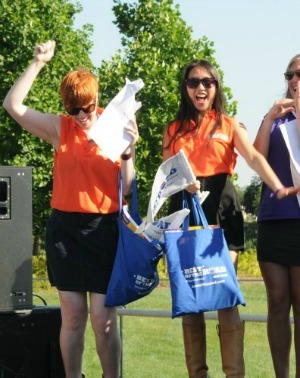 The five Best of the Road Rally Teams met in Washington DC on June 15 for the kick-off party. 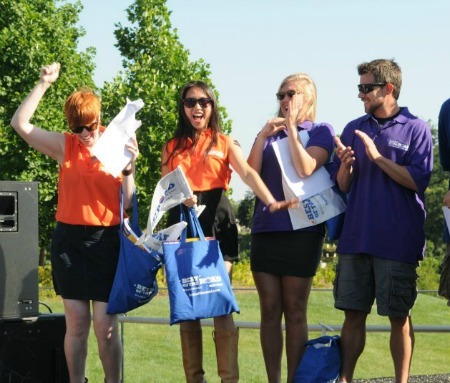 The kick-off party is when the teams were told their category and destinations. And here's the Fresh Traveler Team when they found out their category and destination was Most Fun Small Towns in America. 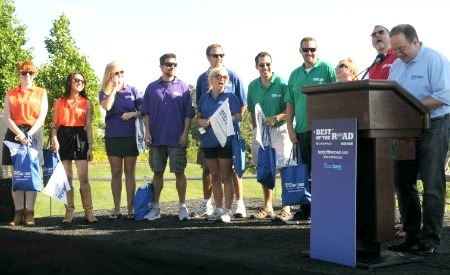 July 15th, wraps up the Best of the Road Rally when the teams will arrive in Seattle, WA where the 2012 Best Small Towns in America will be announced. The grand finalist in each category will be highlighted in Rand McNally’s 2013 Road Atlas and in USA Today's Travel site. Rand McNally - USA Today Best of the Road Tour will be featured in a one-hour television special on the Travel Channel - Hosted by Travel Channel’s own Bert Kreischer. Do you think they are excited? Crane's Beach House Tiki Bar - 4PM! Join us at Crane's Beach House and Tiki Bar for some Pre-Rally fun starting at 4 PM. Live music by the incredible DYMiN! Free stay at Crane's to one lucky winner! This event is free and open to the public. 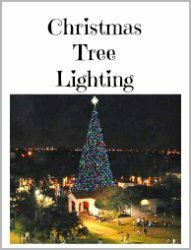 Please stop by and have a glass of Crane's famous Sangria and some tasty treats from local restaurants like Anthony's Coal Fired Pizza, Ziree Thai and Sushi, Crepe's by the Sea and Nipote's Desserts. The rally starts with Amber Leigh, giving a free concert from 5:30 - 6:30 PM at the Old School Square outdoor pavilion. Mayor Woodie Nelson will introduce our Best of the Road Rally Team the "Fresh Traveler" Patricia Serrano and her college roommate, Anna Haas. The Drew Tucker Academy will provide entertainment from 6:30 - 7:30 PM at Worthing Park. 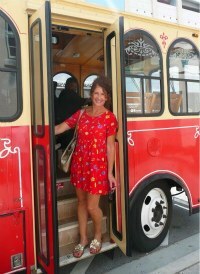 Travel Channel will be filming at Worthing Park. We want a big crowd at Worthing Park!!!!! And we need cheerleaders!!!! Bring yourself, your friends, and be prepared to have some fun! After all...we are the Most Fun Small Town in America! Text “McNally” to 71441 for a coupon good for extended happy hour at Salt7, the new restaurant/bar at Worthing Park.